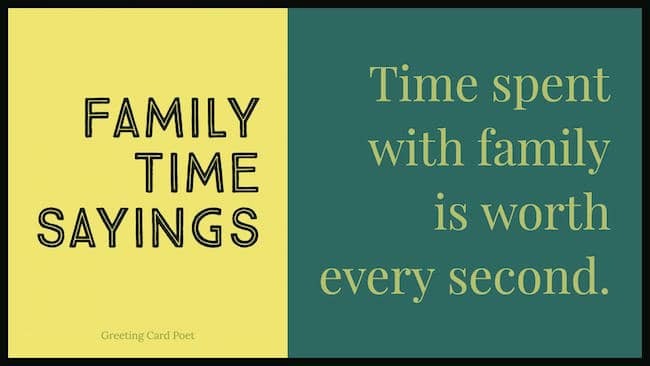 These family time quotes and sayings will have you thinking about your own clan within seconds. There is nothing like family and nothing can replace it. Even Walt Disney, known well for his devotion to his work, once said, “A man should never neglect his family for business.” If you put the most precious things in all the world together, most people will rank their family as the most important of them all. It is your family that’s going to stand by you when you have no one. Your family can do things for you that no one else can. Some of the most successful people in history have attributed their love for their family as the inspiration for their success. 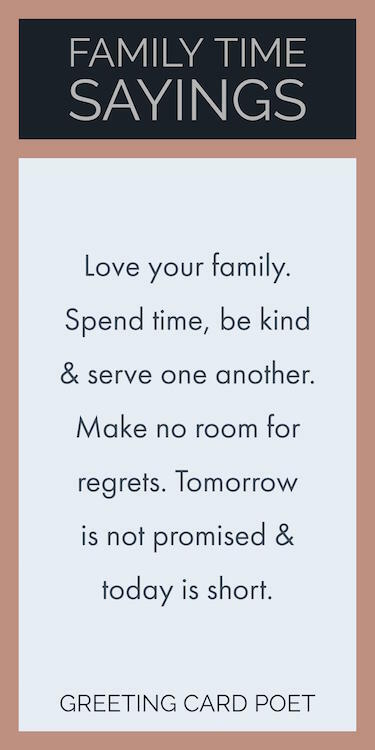 Here are some lovely family time quotes and sayings to help you realize how much important it is to spend your time with your loved ones. No matter how much money or success you have, it is the time spent with your family that’s going to count the most. At the end of your life, you will never regret not having passed one more test, not winning one more verdict, or not closing one more deal. You will regret time not spent with a husband, a friend, a child, a parent. Family time is sacred time and should be protected and respected. Check out this collection of funny dad jokes. No one have a perfect family, but mine is perfect for me. Having somewhere to go is home – Having someone to love is family. Having both is a blessing. Family is your most reliable source of support in any situation because love from your family is unconditional. If you have friends and family who love you unconditionally – you truly have everything. Family is the only why of life. If you are too busy to enjoy time with your family, then you need to reevaluate your priorities. 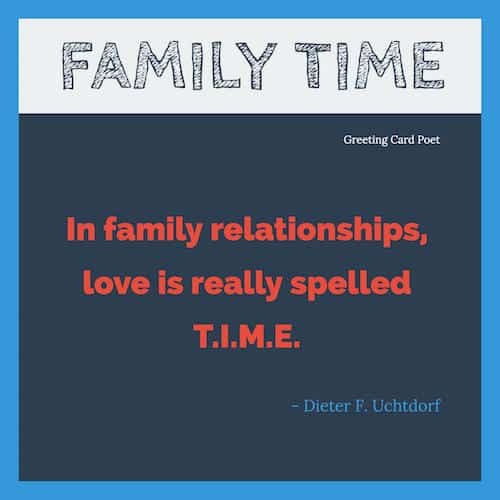 Tip: These family time quotes work well for photo captions on Instagram and Facebook. We all struggle with limitations. Some we’re willing to accept, and some we’re not. It’s never too late to grow in life. For me though, the hero of my family is my family, because of who we are together. Back in ’68, when I was sweeping up hair in that barbershop, I had this mental picture of the family that, if I was lucky enough, I would end up with. Perfect wife, perfect kids… Well guess what? I didn’t get any of that. I wound up with this sorry bunch. And I’m thankful for that every day. Well, most days. Jay: I’m sick of Marty lumping me into the same age category as him. Guys like us, back in our day. I’m a baby boomer for God’s sake. I know all the words to Light My Fire. Cam: Well, technically this is your fault because we were afraid our marriage was getting as boring as yours. Mitchell: Though based on your outfit, we need to work a little harder. Mitchell: So, we haven’t told the family yet but we’ve decided to adopt a baby boy. Cam: From America this time, you might say we’re buying domestic. Mitchell: In private. You might say that in private. It’s scary to let people see the real you, even when these people are your own family. But aren’t they the ones we should be least worried about? The ones who will love us without judging, who forgive our faults and celebrate our imperfections, maybe even encourage us to let our true selves shine through. Family is family. Whether it’s the one you start out with… the one you end up with… or the family you gain along the way. 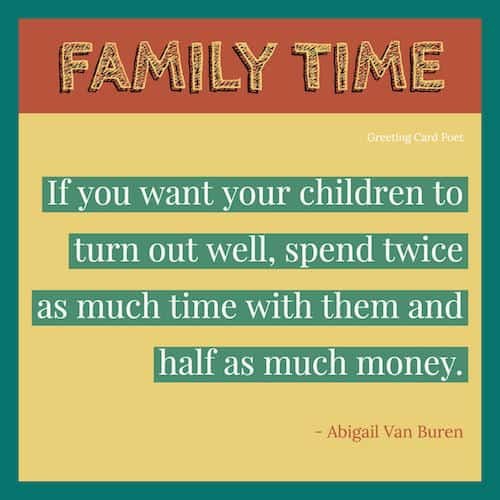 If you have any suggestions for family time quotes and sayings, please let us know on our Contact page. Thank you. You’re on Family Time Quotes and Sayings.